Had a great time last night stargazing with Rush, an amateur astronomer from New Mexico. He had attended the talk I gave at the Grand Canyon, and we met two days later at the evening program by Tyler Nordgren. He asked if he could meet me at Petrified Forest, and he would bring his telescope. It was a great opportunity to see things in a really dark sky with someone who knows about the constellations and other objects. Rush arrived about 4:15 p.m. Thursday, and we told the rangers we would be out and about after dark. The park closes at 5 p.m. in the winter and reopens at 8 a.m. But as artist-in-residence, I’m allowed in at all hours. We had an early dinner, and then headed out just after 6 p.m. I was given a key to lock and unlock the big gate that closes off the entrance. We chose one of the elevated viewpoints that had a 360 degree view of the area. Unfortunately, it also had a nice view of Interstate 40, which bisects the northern part of the park. 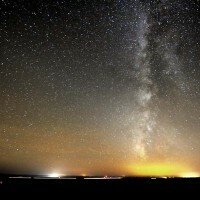 As the twilight faded, more and more stars were visible, and the band of the Milky Way grew brighter directly overhead. It seemed like the sky was closer than ever – an impressive sight. Rush used his van to block the breeze from the west as it was getting cold after the sun set. He set up his telescope, a modest-sized one that he likes since it travels well. 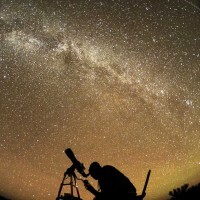 We looked at double stars, the Andromeda Galaxy, star clusters and details of the Milky Way. Jupiter was spectacular; we could see 2 of the moons, plus a tiny point of light at one corner of the planet that we thought was a 3rd moon. That soon disappeared, maybe around the back side of Jupiter. We saw two of the big horizontal stripes that cross the planet made up of gases swirling in the atmosphere. I broke away to shoot a few photos; turns out there is quite a bit of scattered light in the air around the park. To the west there was a bright dome on the horizon that was the town of Holbrook, and there seemed to be haze or moisture that was reflecting some light down to the ground. But the Milky Way hovering over I-40 made for an interesting picture. Maybe when I get deeper into the park it will be darker. It was nice to be with another person in the darkness after going out alone in the Grand Canyon. Didn’t have to worry about animals in the dark or a stray tourist. Also, Rush knew his way around the sky and was able to point out how to find things. Something I need to learn more about. Overall a fun experience for both of us.